Nazifa Kachi was playing with her friends in Bombay Port Trust when she noticed something odd about her neighbor. That wasn’t the first time Nazifa saw women in her community beaten and bruised by their husbands. Even as an 11-year-old, she is no stranger to the horrors of domestic violence because it was right in her own community. BPT is a community located along the coastline of Mumbai. Nearly 100,000 families live on the land in less than humane conditions. Since BPT is an illegal slum, residents are not provided with basic necessities like water and electricity and have to pay 50 to 200 times more for inconsistent access to those amenities than more affluent citizens (Subbaraman, 2015). The possibility of the government destroying the shanties looms over residents every day, and demolition in some areas has already begun. BPT’s problems don’t stop there. Social issues and inequality run rampant through the community. Mumbai has seen a 354 percent increase in rapes since 2011, many of those taking place with alarming regularity in slums like BPT (Hafeez, 2016). Because of this, parents have to be very careful about letting their daughters leave the home for short errands or playdates with friends. Even a trek to school can be dangerous. Since her parents and her four-month-old brother now call BPT home, Nazifa is determined to make a difference. 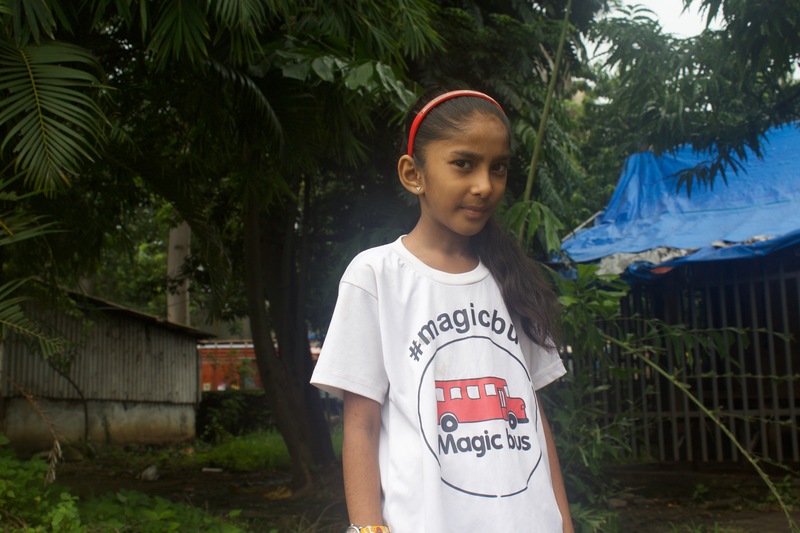 Nazifa has been a Magic Bus participant for four years and is in fifth grade. Every week, she and her friends attend Magic Bus sessions delivered by mentors from her same community. Nazifa’s mentors are her favorite part about Magic Bus, and she said they have been helpful on her journey for justice. Their job is to deliver important sessions to participants such as the importance of health and gender equality, but they also helped Nazifa. She said after she complained to them about the violence in the community, Magic Bus staff raised awareness to local families and children that domestic violence is a dehumanizing and criminal offense in India. “In the sessions, Nazifa reflects those lessons and wants quick action,” Ravi said. Magic Bus also takes participants to the local police station, where they interact with officers. Nazifa befriended one of the officers and got their phone number in case she saw another incident of domestic violence. “She is the only girl around here that does this kind of thing,” Ravi said. Nazifa has big dreams for the future: both for her community and personally. She aspires to have a career in the medical field and will be the first in her family to go to college. Her ultimate goal, she said, is to help those around her. Originally produced for Magic Bus.